Boasting a sauna Northstar - Wolf Tree Cabin is situated in Wood Vista. The property has garden views and is 37 km from Reno. The holiday home is equipped with a TV. The bathroom has a hot tub. South Lake Tahoe is 35 km from the holiday home while Carson City is 24 km away. 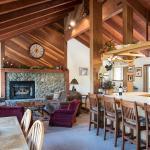 The nearest airport is Reno-Tahoe International Airport 37 km from Northstar - Wolf Tree Cabin.